Monohull one-design racing is as popular as ever, but it can be harder to find affordable one-design multihulls, especially trimarans. Corsair Marine aims to change that with its Pulse 600, a trailerable, 20-foot trimaran designed and built for the one-design market. Successful one-designs must be able to travel to compete, and that requirement can hinder wide-beamed multihulls. The Pulse’s beam is 19 feet 8 inches, but the boat folds down in minutes to 6 feet 11 inches. It weighs less than 1,000 pounds and comes with a composite cradle that is adaptable to a trailer cradle or a beach dolly. The Pulse 600 isn’t just a one-design racer, it’s also an entry-level trimaran. The beach is a perfect place to daysail a Pulse because it has a 9-inch board-up draft and a cassette-style rudder. The self-draining cockpit comfortably carries a crew of four, but it can be singlehanded. The Pulse’s two headsails are roller furling and all the controls are within reach of the helmsman. The mainsheet is on a traveler aft. There is plenty of extra room on the trampolines. The forward cabin is weatherproof and is about the size of an adult, and there is a watertight storage compartment forward of the mast. The mast is alloy composite and the hull is GRP on a carbon frame. The mainsail and jib are 290 square feet; the Pulse also has a spinnaker and a 206-square-foot headsail that Corsair calls a “flying headsail,” and says is similar to a code zero or A1. For comparison, a 19-foot, 700-pound Lightning’s sail area is 61% of the Pulse’s, giving some idea of the trimaran’s horsepower. The Pulse 600 is built in Vietnam, but North American Corsair owners have formed a vibrant sailing community with an up-to-date website, sail.corsairmarine.com. The 30-year-old boatbuilding company provides considerable support for its sailors and boats. Placed between stocky cruising multihulls and racing multihull development classes, Corsair Marine’s Pulse 600 is in a sailing sweet spot. 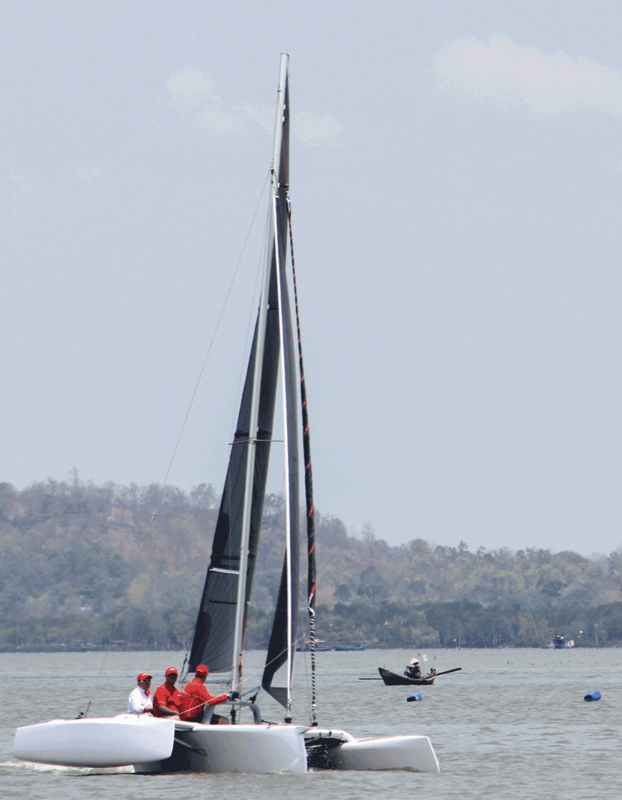 LOA 19’8”; LWL 19’8”; Beam 14’9”; Beam folded 6’ 11”; Draft 9” (board up), 3’11” (board down); Sail area 290 sq. ft.; Displ. 981 lbs.